Renee Donahue, right, receives the Penn State Alumni Achievement Award from Alumni Association CEO Paul Clifford. 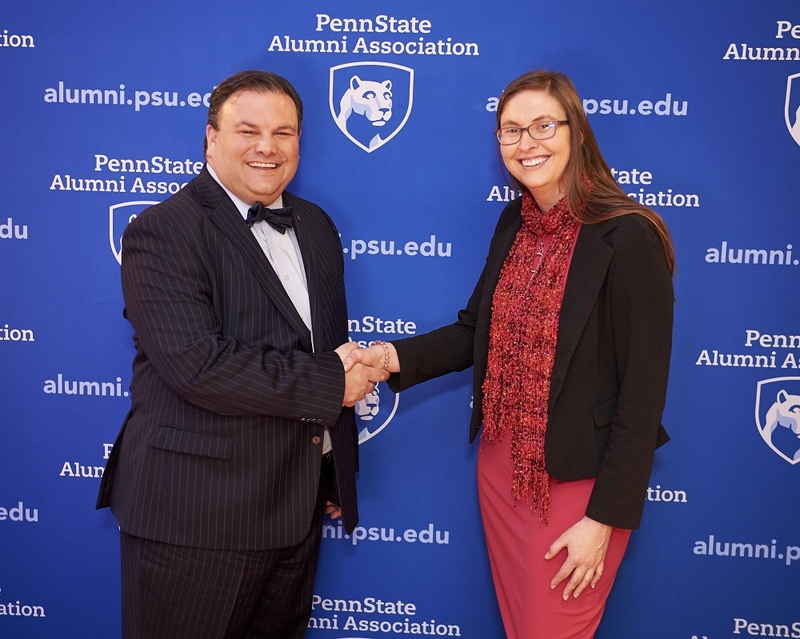 The Penn State Alumni Association honored Renee Donahue, a 2011 graduate of the Cellular and Molecular Biology graduate program at Penn State College of Medicine, with the Alumni Achievement Award on March 29. She was one of 15 prominent young alumni to receive recognition for their extraordinary professional accomplishments. Donahue is currently a staff scientist and head of the Molecular Immunology Group in the Laboratory of Tumor Immunology and Biology at the National Cancer Institute. Her team is working to characterize the immune response of patients enrolled in cancer immunotherapy clinical trials. By studying how immune cells and tumor cells interact, they hope to identify effective combinations of cancer immunotherapies and novel targeted agents. Since joining the National Cancer Institute, Donahue has contributed to the field of cancer immunology in critical ways. Her team worked on the initial experimentation to determine the effect of avelumab on the immune system, work crucial to U.S. Food and Drug Administration approval of the drug. 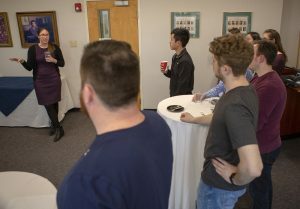 Donahue talks to Penn State College of Medicine students at a March 28 reception. In 2018, Donahue received the Federal Lab Consortium Award for Excellence in Technology Transfer, one of the most prestigious honors in translational science. Donahue’s work in cancer research began at the College of Medicine where she studied inhibitory mechanisms in cancer cells. Her contributions, both individually and as a team member, were recognized by faculty members as exceptional. Patricia McLaughlin, professor of neural and behavioral sciences and Donahue’s thesis advisor, recalled that Donahue was an asset to her lab and had an admirable devotion to her work. “She played a major role in advancing our knowledge of Opioid Growth Factor (OGF)-Opioid Growth Factor Receptor (OGFr) Axis,” said McLaughlin. Opioid growth factor is useful in inhibiting cancer cell growth, but only if OGF receptors are present in the cancer cells. Donahue’s key contributions during her time at Penn State College of Medicine included the establishment of cell lines that both lacked and overexpressed OGFr and the examination of more than 30 human cancer cell lines for the presence of OGF-OGFr axis. She had seven first author papers related to her work on ovarian cancer as a graduate student and has contributed to more than 40 publications throughout her career. McLaughlin credits Donahue’s success as a graduate student to many factors. “She was willing to learn,” said McLaughlin, “She was very open-minded and took criticism well.” Donahue was also known for her strong time management skills, ability to collaborate with peers and passion for research.